The 2004 Honda CRF 80 for sale is an 80cc Honda dirt bike that has a new rear tire, rear wheel bearings, sprockets, chain, brake and clutch levers, spark plug, air filter and runs GREAT. The motorcycle has a small tear in seat cover and a chip on the tip of the rear fender. This is a great deal for somebody looking for a reasonably priced bike. If you would like you can review the 04 model CRF80 using the space below that has been provided by GoGoCycles Honda Dirt Bike Classifieds for your convenience. In my opinion you won't find a better deal on a used Honda dirt bike for sale in Georgia, on Craigslist or in an Ebay auction so hurry and make an offer before it gets away from you! 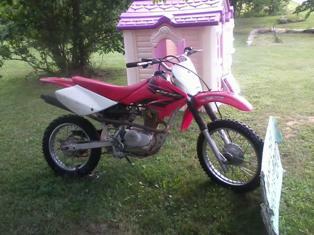 The 2004 Honda CRF 80 for sale is in Rome GA Georgia and my asking price for the 80cc dirt bike is a very cheap $650. Call regarding the CRF80 seven zero 67 six six 486 seven. Would you do 3 or 4 hundred ? Cash pickup.